The cherry blossom season in Japan can be elusive, and a large part of catching its pale pink blooms has to do with luck. 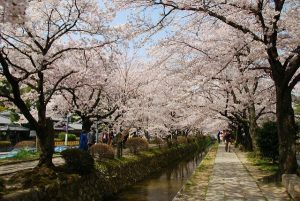 That fact doesn’t deter thousands of travellers from descending on the country during its spring each year in the hopes of seeing the ethereal cherry trees covered in flowers. Ahead, we share tips for planning a cherry blossom tour of Japan, giving you the best shot possible of experiencing sakura season (as it’s locally known) at its peak. When is cherry blossom season in Japan? Generally, the Japanese cherry blossom season is from late March to early April, and the trees are only in bloom for about a week. For that reason, locals and travellers closely observe the flowering of cherry trees: blink, and you could easily miss the window. 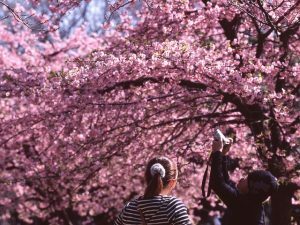 You’ll find that Japan’s major tourism bodies and meteorological associations will start to post official cherry blossom forecasts in late January each year, so bookmark sites such as the Japan National Tourism Organization and Japan Guide. You can even download apps to track the development of cherry blossoms! The fleeting nature of the cherry blossom season in Japan is apart of its appeal, and it will be all the more satisfying when you get the timing right. If the stars align and you land in Japan for the peak week of cherry blossoms (say, on a Webjet Exclusives Japan tour during the season), you’ll be able to see the delicate pink flowers crowning trees and showering footpaths pretty much everywhere you go. However, there are some places with large concentrations of cherry trees to add to your itinerary. Situated next to the Imperial Palace in the Chiyoda district, Chidorigafuchi Moat is one of the best spots for hanami (flower viewing) in Tokyo. Arrive early, and you can take a romantic rowboat tour of the cherry blossoms. The wait times for boat hire can be long, however, and wandering through the tunnel of cherry trees alongside the water will be just as magical. The Chiyoda Cherry Blossom Festival that happens here sees the walkway’s hundreds of trees lit up at night, making the scene especially mesmerising. The Osaka cherry blossom season closely follows that of Tokyo, so you can hop on the train to continue your petal peeping. It will be well worth it too, as the Expo ’70 Park, with its 5000-odd cherry trees, is one of the most significant groves in the country. This expansive park is around 30 minutes’ from the Osaka city centre and, as the name suggests, hosted a World Expo on its grounds. Many of the attractions from that event remain, including sculptures, landscaped gardens, and museums. People flock here for picnics during sakura season, and this large park provides plenty of space for you to throw down a rug too. Sakura season in Kyoto is a few days after Tokyo and Osaka, so if you plan accordingly, you’ll be able to see the cherry blossoms in this popular spot too. The Philosopher’s Path is a walkway that follows a canal lined with hundreds of cherry trees on either side, creating an archway over the water that sees fallen petals decorate its stream. The path begins at the Silver Pavilion, one of Kyoto’s famous temples, and runs for two kilometres to the neighbourhood of Nanzenji. There are also some cafes and restaurants alongside the promenade for you to stop and refresh while taking in the blossoms. For a truly iconic experience of the cherry blossom season in Japan, how about seeing its fluffy pink trees framing Mount Fuji? It doesn’t get much better than that. This colder part of Japan has a later season (up to a week after Tokyo and Osaka, usually in early April), so pop it at the end of your itinerary. There are several stunning spots to take in Mount Fuji’s snow-capped peak rising from the blooming cherry trees, but two of the best are the northern shores of Lake Kawaguchiko and the newly constructed Chureito Pagoda. The former has a walkway lined with cherry trees on the one side and the glistening lake reaching out to Mount Fuji on the other, and is a serene place to take in the blossoms. The latter provides an elevated outlook with the pagoda in the foreground, Mount Fuji in the background and cherry trees in between, creating a highly photogenic scene. Many of the major viewing areas hold cherry blossom ‘festivals’, which means that pretty paper lanterns are strung around the trees to add to the scenery. To name a few, the Chiyoda Sakura Festival and Ueno Cherry Blossom Festival both take place in Tokyo, and the Fujikawaguchiko Festival happens on the shores of Lake Kawaguchiko near Mount Fuji. 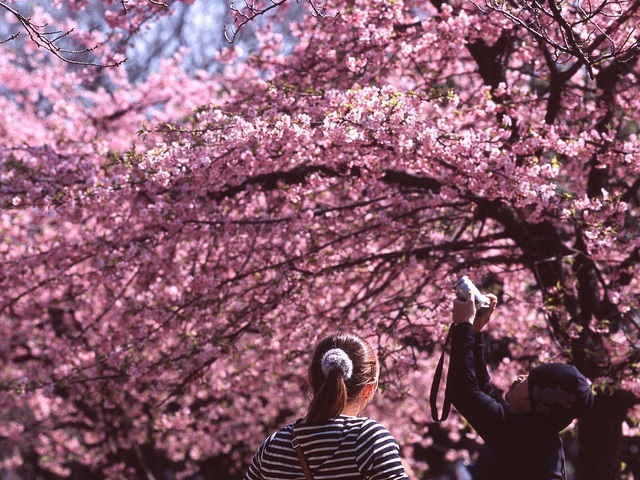 As well as those celebrations ensuring you can enjoy the blooms well into the night, you’ll find cherry blossom-themed food, drink and activities across Japan during the season – from vendors selling picnic packs to enjoy under the trees, to cherry blossom-flavoured treats. Give yourself the best shot of catching the blooms in action by booking a Webjet Exclusives Japan tour with dates during cherry blossom season. These departures are highly sought-after, so make sure to get in quick!